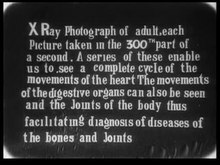 Dr. Macintyre's X-Ray Film (1896). Teleradiology is the transmission of radiographic images from one location to another for interpretation by an appropriately trained professional, usually a Radiologist or Reporting Radiographer. It is most often used to allow rapid interpretation of emergency room, ICU and other emergent examinations after hours of usual operation, at night and on weekends. In these cases, the images can be sent across time zones (e.g. to Spain, Australia, India) with the receiving Clinician working his normal daylight hours. However at present, large private teleradiology companies in the U.S. currently provide most after-hours coverage employing night working Radiologists in the U.S. Teleradiology can also be used to obtain consultation with an expert or subspecialist about a complicated or puzzling case. In the U.S., many hospitals outsource their radiology departments to radiologists in India due to the lowered cost and availability of high speed internet access. 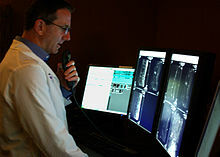 Radiology is an expanding field in medicine that has expanded rapidly after 2000 due to advances in computer technology, which is closely linked to modern imaging techniques. Applying for residency positions in radiology is very competitive due to extremely high compensation. Applicants are often near the top of their medical school classes, with high USMLE (board) examination scores. 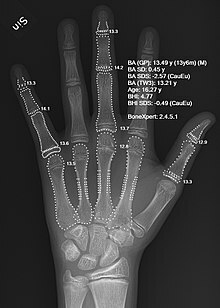 The field is rapidly expanding due to advances in computer technology, which is closely linked to modern imaging. Diagnostic radiologists must complete prerequisite undergraduate education, four years of medical school to earn a medical degree (D.O. or M.D. ), one year of internship, and four years of residency training. After residency, radiologists may pursue one or two years of additional specialty fellowship training. Some medical schools in the US have started to incorporate a basic radiology introduction into their core MD training. New York Medical College, the Wayne State University School of Medicine, Weill Cornell Medicine, the Uniformed Services University, and the University of South Carolina School of Medicine offer an introduction to radiology during their respective MD programs. 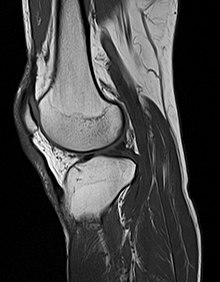 Campbell University School of Osteopathic Medicine also integrates imaging material into their curriculum early in the first year. Radiology is an extremely competitive speciality in the UK, attracting applicants from a broad range of backgrounds. Applicants are welcomed directly from the foundation programme, as well as those who have completed higher training. Recruitment and selection into training post in clinical radiology posts in England, Scotland and Wales is done by an annual nationally coordinated process lasting from November to March. In this process, all applicants are required to pass a Specialty Recruitment Assessment (SRA) test. Those with a test score above a certain threshold are offered a single interview at the London and the South East Recruitment Office. At a later stage, applicants declare what programs they prefer, but may in some cases be placed in a neighbouring region. Radiologists in Singapore complete a five-year undergraduate medicine degree followed by a one-year Internship (medical) and then a five-year residency program. Some Radiologists may elect to complete a one or two-year fellowship for further sub-specialization in fields such as interventional radiology. ^ Bittersohl B, Freitas J, Zaps D, Schmitz MR, Bomar JD, Muhamad AR, Hosalkar HS (May 2013). "EOS imaging of the human pelvis: reliability, validity, and controlled comparison with radiography". The Journal of Bone and Joint Surgery. American Volume. 95 (9): e58–1–9. doi:10.2106/JBJS.K.01591. PMID 23636197. ^ Novelline RA, Squire LF (1997). Squire's Fundamentals of Radiology (5th ed.). Harvard University Press. ISBN 978-0-674-01279-0. ^ Herman GT (14 July 2009). Fundamentals of Computerized Tomography: Image Reconstruction from Projections (2nd ed.). Springer. ISBN 978-1-84628-723-7. ^ "Magnetic Resonance, a critical peer-reviewed introduction". European Magnetic Resonance Forum. Retrieved 16 November 2014. ^ Parker D. "Intervention as an Extended Role: My Journey" (PDF). UKRC & Queen Elizabeth Hospital Birmingham. Retrieved October 8, 2015. ^ Kaufman JA, Reekers JA, Burnes JP, Al-Kutoubi A, Lewis CA, Hardy BW, Kuribayashi S (August 2010). "Global statement defining interventional radiology". Journal of Vascular and Interventional Radiology. 21 (8): 1147–9. doi:10.1016/j.jvir.2010.05.006. PMID 20656219. ^ "USMLE Scores and Residency Applicant Data, 2009: Diagnostic Radiology" (PDF). ^ "A Day in the Life of a Radiologist". 2017-12-28. Retrieved 2018-03-15. ^ "Department of Radiology and Medical Imaging — School of Medicine at the University of Virginia". Healthsystem.virginia.edu. 2012-02-17. Retrieved 2012-08-03. ^ "School of Medicine". New York Medical College. Archived from the original on 2010-05-28. ^ "Integrated ultrasound curriculum (iUSC)". SpringerImages. 2011-03-25. Retrieved 2012-08-03. ^ "A Pilot Study of Comprehensive Ultrasound Education at the Wayne State University School of Medicine". Jultrasoundmed.org. 2008-05-01. Archived from the original on 2010-07-13. Retrieved 2012-08-03. ^ "Specialty recruitment". Royal College of Radiologists. Retrieved 2017-03-02. ^ a b "Vacancy / Clinical Radiology". oriel.nhs.uk. Retrieved 2017-03-02. ^ "The Society of Radiologists in Training". Society of Radiologists in Training. Retrieved 8 February 2015. ^ Arora R (December 2014). "The training and practice of radiology in India: current trends". Quantitative Imaging in Medicine and Surgery. 4 (6): 449–50. doi:10.3978/j.issn.2223-4292.2014.11.04. PMC 4256238. PMID 25525575. This page was last edited on 21 March 2019, at 19:25 (UTC).